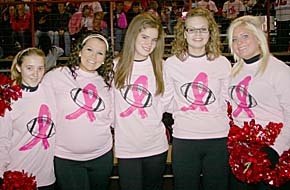 To mark Breast Cancer Awareness Month in October, “Pink Out Night” was used as the theme for Boone Central High School’s home football game last Friday night, Oct. 14. The event grew much larger than initially anticipated. 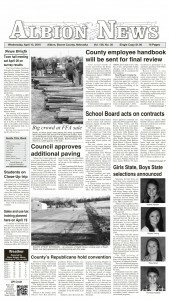 Amanda Lipker designed a BCHS Pink Out 2011 shirt, and approximately 600 orders were placed. Many football players and coaches wore pink accessories, such as pink ribbon stickers for football players’ helmets, arm bands, shoelaces, socks, shirts, hats and beanies that were readily seen during the game. Funds were raised with a cake raffle, caramel apple and t-shirt sales to support LeaAnn Wells, who is currently battling breast cancer.